The Canadian federal government recently announced investments of $2.89 million for four projects to enhance marine incident prevention and responsiveness along Canada’s ocean coastlines. Through its Oil Spill Response Science (OSRS) program, the federal government provided $991,500 to C-CORE, a St. John’s-based research and development company, to increase the efficiency of existing mechanical oil recovery systems for heavy oil products in harsh, cold environments. The government of Newfoundland and Labrador will also provide $428,500 to the project. “This project leverages C-CORE’s expertise in analytical modelling, computer simulation and large-scale physical tests to assess and optimize technology performance in harsh environments,” Mark MacLeod, C-CORE president and chief executive officer, said in a statement. The main intermediate outcome of this project consists of an improved oil spill collection and separation system that can be integrated in an efficient response technique including a specially designed vessel. The system will be based on the established concepts and proven technologies for recovery of heavy oil spills from sea water in cold and ice prone ocean environments. The long-term outcome of the project will include specialized vessels with the required detection, storage, and spill removal systems, tested and proven in the real life conditions. Project partners with C-CORE include Elastec, Eastern Canada Response Corporation Ltd. (ECRC), and InnovatechNL. A further $400,000 will go to a University of Toronto project that will develop a sorbent-based direct oil collector (called In-Situ Foam Filtration System or ISFFS) for use in oil spills. This system will be capable of directly reclaiming the dissolved, emulsified, dispersed, and free oil from marine spill sites. To meet this objective, the development of advanced functional foams (sorbents), implementing a bench-top system, and design and optimization of in-situ filtration process as a proof-of-concept will be undertaken. The ISFF will directly collect the oil from the spill site by pumping through oil sorbent bed, which serves as the filtration media. For this type of foam, there is no need for high oil-sorption capacity thus, functionalizing the foam with toxic and expensive elements can be avoided along with minimizing material costs. Moreover, the in-situ filtration will make the oil sorption process continuous, simplifies oil collection, making oil spill response quicker and more cost effective. Project partners include Tetra Tech, Polaris Applied Sciences Inc., Dr. Foam Canada, Gracious Living Innovations Inc., and ShawCor Ltd. The OSRS program will be contributing $600,000 towards a $1.65 million project be undertaken at the University of Alberta. The project involves the development of an on-board membrane based hybrid oil/water separation system. If successfully developed, the system will significantly increase the capacity of recovery vessels that physically collect oil spilled at sea, thereby reducing the cost and spill response time for cleanup. The technology can be directly and easily incorporated into existing rapid deployment spill clean-up systems mounted on ships or barges. It would be ready to commercialize for manufacturers of existing oil spill clean-up tankers, making the research easy to implement for large or small-scale spills and for potential use in future high-risk areas of development. Finally, the federal OSRS program committed $925,000 to BC Research Inc., a company with a broad experience in chemical product development, to further develop a hybrid spill-treating agent (STA) that will help slow or prevent the spread of an oil slick on water. If the R&D project is successful, a hybrid STA will be commercially available that can be used to combat marine oil spills at large scale. The hybrid STA would have both gelling and herding properties, to prevent or slow down the spreading of an oil slick by rendering it into a thickened (gelled) state, as well as to use it as a herding agent, to facilitate either controlled burn or skimming operations. Current oil recovery rates for spills on water are estimated to be in the range of 10-20%. With current STAs, there are few options to prevent or slow down weathering processes, including spreading and dispersion. Delaying the spreading and weathering process would potentially facilitate cleanup and improve the degree/rate of oil removed. Project partners include NORAM Engineers and Constructors and the University of British Columbia. As reported in the Buffalo Law Journal/Buffalo Business First, Gov. Andrew Cuomo designated four Brownfield Opportunity Areas in Buffalo last month, providing another tool for area stakeholders to have the areas developed. He designated areas in South Buffalo, the Buffalo Harbor, the Buffalo river corridor and the Tonawanda Street corridor. It’s a three-step grant process to determine how to revitalize a brownfield area, Hecker said. In the pre-nomination phase, a municipality and associated groups look at an area that may have an issue and explore ways to revitalize the area. In the nomination process, funding sources are considered, as well as market trends. And in the third step, implementation of the plan is identified and there’s a thorough accounting of funding sources. “It’s a wholesome package that the state has developed as a basis to spur economic development,” Hecker said. The three steps are completed through the New York State Department of State. Once the governor designates a brownfield opportunity area, various programs can lead to more state benefits. “If you do your redevelopment project through a BOA, there are additional tax credits available,” Hecker said. He said the designations fit in with the city’s Green Code under Mayor Byron Brown. “(BOAs) are a central component of our city’s Green Code initiative and my administration’s place-based economic development strategy,” Brown said in a statement. Some of the areas will need to go through remediation in order to be redeveloped, according to Hecker. For instance, the South Buffalo Brownfield Opportunity Area, which consists of approximately 1,968 acres in an area that was once heavily industrialized by the steel industry, has sites that will require remediation. Plans for that site include a nine-hole golf course, indoor and outdoor recreation and expansion of the Tifft Nature Preserve. The Buffalo River Corridor Brownfield Opportunity Area also has long-standing contamination issues. It’s made up of 1,050 acres in the Old First Ward, containing 58 possible brownfield sites. “One of the main areas of that project is restoration and enhancement of the environmental quality of the river and enhancing waterfront access,” Hecker said. 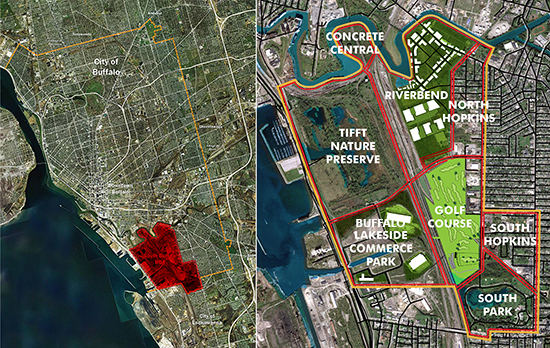 The Buffalo Harbor Brownfield Opportunity Area is 1,045 acres, with six brownfield sites. The area includes waterfront space at both the Inner and Outer harbors. Assemblyman Sean Ryan said BOA designation will help with future waterfront development. The Tonawanda Street Corridor Brownfield Opportunity Area is 650 acres containing 46 potential brownfield sites. Plans include reconstruction of the Scajaquada Expressway and restoration of Scajaquada Creek. Hecker said the designated areas represent places where longtime residents can see the potential benefit to redevelopment. “One of the interesting things to me about these projects is that they really are fully integrated community projects,” he said. Brownfield funding is available at the federal level through the Environmental Protection Agency, as well, Hecker said. While the Trump administration has pared back the EPA, Administrator Scott Pruitt has said that brownfields would remain a priority to the agency. “There hasn’t been any change in that area,” Hecker said. Pruitt is focused on shifting the responsibility for contaminated sites to states, Hecker said. “(Pruitt) wants states to work together with the federal government in a limited capacity to manage these things on their own,” he said. The Supreme Court of Canada (SCC) granted leave to hear the appeal of Orphan Well Association v Grant Thornton Limited.1 The SCC will reconsider whether trustees and receivers in bankruptcy must remediate wells in priority to the claims of secured creditors. 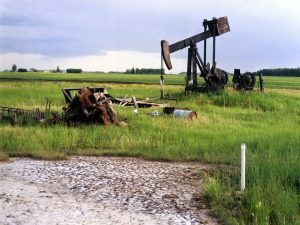 In April 2017, the Alberta Court of Appeal released its decision in Redwater.2 The Court found that the Government of Alberta’s environmental orders for oil well remediation did not have priority over secured creditors in bankruptcy proceedings. In upholding the lower court’s decision, set out in our previous update, the Court of Appeal added to the “untidy intersection” between bankruptcy proceedings and provincial environmental law. Both Courts concluded that receivers and trustees were permitted to renounce an insolvent debtor’s interest in its licensed assets while selling valuable licensed assets to maximize recovery for secured creditors. The decision, as it stands, allows receivers and trustees in bankruptcy to disclaim unprofitable assets and not be required to fulfill certain environmental obligations associated with those disclaimed assets. The case revolves around the assets of a junior, insolvent oil and gas producer, Redwater Energy Corporation (Redwater). When Redwater’s primary secured creditor began enforcement proceedings under the Bankruptcy and Insolvency Act (BIA), Grant Thornton Limited (GTL) was appointed as receiver and trustee.3 Several of Redwater’s oil wells had costs of remediation exceeding the value of the wells. GTL took control of only 20 of 127 Redwater’s assets and disclaimed the oil wells that had onerous environmental abandonment costs. The Alberta Energy Regulator (AER) ordered GTL to remediate the disclaimed oil wells before distributing funds to creditors. When GTL indicated that it did not intend to remediate the wells, AER and the Orphan Well Association (OWA) brought applications asking the court to void GTL’s disclaimer of the non-producing wells and order GTL to comply with AER’s orders. AER argued that Redwater’s insolvency and bankruptcy did not affect Redwater’s environmental obligations and that GTL was legally required to discharge those obligations before paying Redwater’s creditors. GTL brought a cross-application challenging the constitutionality of AER’s stance on GTL’s environmental obligations and seeking approval of the sale of Redwater’s valuable wells. At issue was whether AER’s orders were provable claims in bankruptcy and therefore subject to bankruptcy proceedings. If AER’s orders were subject to bankruptcy proceedings, other creditor’s claims would take priority. The practical outcome being that the corporation would likely have no means of satisfying its environmental obligations after settling its obligations to other creditors. The cost of remediating the orphan wells would then fall on the Government of Alberta. As we previously reported, Alberta Court of Queen’s Bench concluded that the applicable sections of the OGCA and Pipeline Act (PA) frustrate the federal purpose of the BIA of managing the winding up of insolvent corporations and settling the priority of claims against them. Based on the doctrine of paramountcy, the OGCA and PA were inoperable to the extent that they conflicted with section 14.06 of the BIA. This section of the BIA exempts a receiver or trustee from personal liability, allowing a trustee and receiver to disclaim assets, and prescribes the priority of environmental remediation costs. OWRA and AER appealed the decision. The Court of Appeal upheld the lower court decision. The key issue on appeal was the priority and treatment of environmental claims in bankruptcy, and whether environmental claims were provable claims under section 14.06 of the BIA. The Court found that the BIA was amended in 1997 to specifically address environmental claims. The BIA now incorporates environmental claims into the general bankruptcy process, rather than exempting them. Following the test set out in Newfoundland and Labrador v AbitibiBowater Inc., the Alberta Court of Appeal found that AER’s orders were subject to bankruptcy proceedings.5 By refusing to permit the transfer of Redwater’s valuable assets unless funds were set aside for remediation, AER reduced the environmental obligations to “sufficiently certain” monetary claims. Accordingly, AER cannot indirectly interfere with the value of assets in a bankruptcy by placing financial preconditions on the transfer of AER licences. The Court of Appeal held that there was an operational conflict between federal and provincial regimes. The Court found that the provincial regulatory scheme frustrated the purposes of the BIA, which include determining the priority of claims against insolvent corporations. The practical outcome being that GTL did not have to comply with AER’s remediation obligations prior to settling claims of secured creditors. The dissenting opinion briefly considered the two leading cases in Ontario on environmental claims in bankruptcy and insolvency: Nortel Networks Corporation (Re) and Northstar Aerospace Inc. (Re).6 In Nortel, the Court found that some of the Ministry of the Environment’s (MOE, as it then was) orders had priority over creditor claims, but in Northstar, the Court found that the MOE’s orders did not have priority. The practical implications of Redwater may be far reaching not only for the worlds of bankruptcy & insolvency and oil & gas, but also for the world of director and officer liability. We will look to the SCC to provide clarity on this important, albeit untidy, area of law. 1 2017 ABCA 124 [Redwater]. 3 RSC 1985, c B-3 [BIA]. 4 Redwater at para 21; Oil and Gas Conservation Act RSA 2000, c O-6, s 70 [OGCA]. 6 Nortel Networks Corporation (Re), 2013 ONCA 599 [Nortel]; Northstar Aerospace Inc. (Re), 2013 ONCA 600 [Northstar]. 7 Northstar Aerospace, Inc. (Re), 2012 ONSC 4423. Subsequently, on November 14, 2012, the MOE issued a Director’s Order against the former directors and officers personally. John Georgakopoulos resolves complex environmental legal issues for clients, uniquely drawing on his technical knowledge as a former senior environmental scientist with the Ontario Ministry of the Environment and Climate Change. John is called to the bars of Ontario and Alberta. Giselle Davidian is an associate lawyer practicing in the areas of environmental law, environmental litigation, energy and natural resource law and Aboriginal law. Giselle draws upon her technical knowledge as a former environmental scientist at a consulting engineering firm to help clients meet their goals. Giselle is fluent in French and Armenian and has a working knowledge of Italian. Giselle is called to the bar of Ontario. Serin Remedios is an associate lawyer practicing environmental litigation as well as environmental, Aboriginal, northern and energy law. Serin’s past experience in environmental science helps her understand clients’ problems and assist them in meeting their goals. Serin is called to the bar in Ontario. This article was first published in the Willms & Shier Environmental Lawyers LLP website. By Dema Mamon, M.Sc.Pl, BES and John Nicholson, M.Sc., P.Eng. In Canada, getting approval to construct an oil pipeline has become increasingly difficult. Despite the fact that new, advanced software has led to more sophisticated caesar piping, in Canada every oil pipeline incident that involves a leak and subsequent clean-up is widely covered in the media, providing fuel for pipeline opponents that call an end to the construction of new pipelines. Abacus Data Inc., an Ottawa-based research firm, has been tracking public opinion on the construction of new pipeline capacity and has found some interesting trends. Since 2014, polling has shown that the negative view of building new oil pipelines has remained steady at 21 to 22% range. However, there was a drop in the positive attitude amongst Canadians toward building new pipelines – from 58% in 2014 to 44% in 2017. Over that three year span, a good proportion of Canadians who once viewed building new pipeline capacity with a positive attitude have shifted to a neutral view. The neutral view on oil pipelines have grown from 20% in 2014 to 36% in 2017. There can be many theories to explain the three year shift in public opinion on new oil pipelines. One plausible theory is that oil spills from pipelines typically make headline news, thus leaving an impression in the minds of Canadians the perhaps pipelines are not as safe as the industry states. Oil leaks from pipelines damage the environment, are costly to clean-up, and fuel public opinion that pipelines are not safe. To prevent future spillages and oil theft, the use of something like bunded fuel tanks would be a good place to start, especially since they are environmentally friendly. Anything worth saving the planet and preventing damage is worth doing for sure. One way to eliminate the perception that building new oil pipelines is bad for the environment and shift public opinion in favour of such projects is to build pipelines that don’t leak. However, is it even possible to build leak-proof pipelines? Are Double-Walled Pipelines the Answer? One logical idea for building leak-proof pipelines is for them to be double-walled. The outer wall would serve as protection from external damage. The technology does exist to construct double-walled pipelines and they are used in certain circumstances such as when there is a large temperature difference between the liquid in the pipe and the surrounding environment. Double-walled pipelines are not considered the cure-all by some in the industry. Those resistant to the use of double-walled pipelines note that in some instances, it may be more cost effective to protect pipelines from the potential of external damage by burying them or placing slabs over them in higher risk areas. Furthermore, it can be more difficult to monitor a double-walled pipeline and an outer pipe interferes with the maintenance of the inner pipe. At the University of Calgary, researchers believe their two-walled pipeline design and monitoring system is the solution to preventing spills. 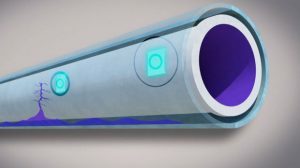 Although double-walled pipelines have been around since the 1980’s, Thiago Valentin de Oliveira, an electrical and computer-engineering master’s student, and Martin Mintchev, an engineering professor, say that their design is superior. 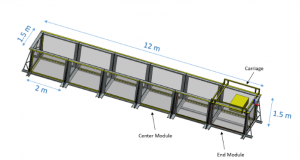 The U of Calgary researchers designed and constructed their prototype to consist of a typical steel inner layer with either a steel or plastic outer layer. There is an air gap between inner and outer pipeline contains the oil that leaks from the inner pipeline leak. The real innovation developed by the U of Calgary is the segmentation of the inter-pipe space and the inclusion of a linear wireless network linking the segments. With the segmentation, a leak of oil from the inner pipe enters the air gap between the two pipes and is contained in a section of pipe. Wireless pressure sensors between the two walled layers detect the pressure build up and send an alert to the pipeline control staff. If commercially implemented, the U of Calgary system would allow pipeline operators with the means of quickly shutting down the pipeline when a leak was detected into the outer pipeline and crews could be dispatched to make repairs. The oil that leaked from the inner pipe would be contained in the air gap between the two pipes and be confined to one section of the pipeline. The U of Calgary researchers estimate that their design would result in an additional 25% in the capital cost of building pipelines. They believe this cost could be reduced if the outer pipeline material was composite materials or plastic. Is Advanced Monitoring the Solution? 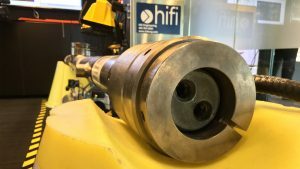 Also in Alberta, a Calgary-based firm, HiFi Engineering, recently announced that it has developed an innovative pipeline leak detection system. Dubbed High-Fidelity Dynamic Sensing (HDS™), the monitoring system can spot the exact location of a leak in a pipeline within seconds of it occurring. The system continuously monitors temperature, sonic and ultrasonic acoustics, and vibration and strain. Any anomaly in the measurements results in an alert being sent to the pipeline company control room. The system works utilizing fiber optic cables that run the length of the pipeline. A laser beam is sent down the length of the optic cable and sends signals back that provide a multitude of information to the pipeline control room. TransCanada Pipelines Corporation has already installed the HiFi HDS™ monitoring system in sections of the Keystone XL oil pipeline that runs from Canada to the U.S. Also, Enbridge employs the technology in its new northern Alberta pipeline. Dema is a graduate of York University’s Bachelor in Environmental Studies program (2008) and the University of Toronto’s Masters of Science in Planning Programme (2010). She is currently pursuing her Canada Green Building Council’s Leadership in Energy and Environmental Design’s Green Associate certification. Her research interests include environmental conservation, green infrastructure, and sustainability. She can be reached at dema.mamon@gmail.com. John Nicholson is the editor of Hazmat Management Magazine. He has over 25 years of experience in the environmental and cleantech sectors. He is a registered professional engineer in the Province of Ontario and has a M.Sc. in environmental engineering. His professional experience includes time at a large engineering consulting firm, a major Canadian law firm, and the Ontario Ministry of the Environment and Climate Change. Perfluoroalkyl and polyfluoroalkyl substances (PFASs) are a group of chemicals that are emerging contaminants of concern due to their persistence in the environment, bioaccumulative potential, and toxicity. 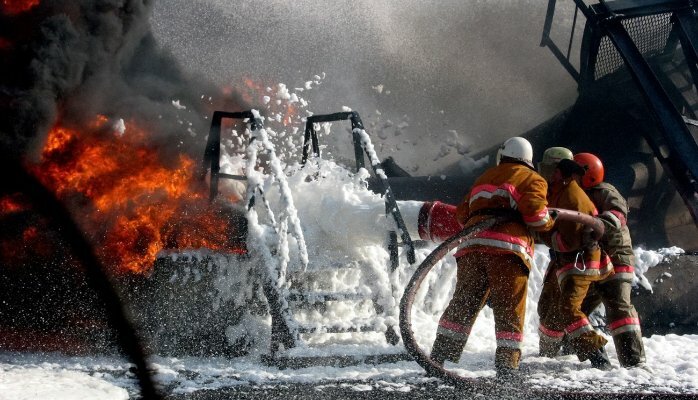 PFASs have previously been used in a range of industrial processes, consumer products (such as 3M’s Scotchgard fabric and upholstery protector), aviation hydraulic fluid and fire-fighting foam. The two main PFASs are perfluorooctane sulfonate (PFOS) and perfluorooctanoic acid (PFOA). The unique properties of PFASs that make them useful in products and industrial processes also mean that they are persistent in the environment and highly mobile. They are therefore challenging to manage and remediate once released into the environment. They are potentially bioaccumulative and potential health effects may include developmental, reproductive and systemic effects and possibly cancer. PFOS has been listed as a persistent organic pollutant (POP) in Annex B of the Stockholm Convention since 2010. The use of PFOS in products has been phased out in Australia since the early 2000’s. Sixteen projects, representing municipalities from across Canada, were named as finalists for six main categories at the Brownie Awards sponsored by The Canadian Brownfields Network (CBN) and Actual Media Inc. 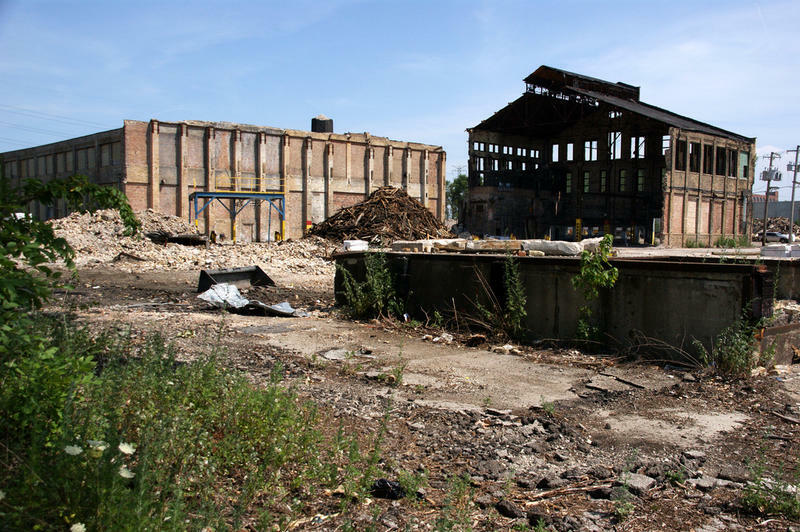 The Brownie Awards recognize the rehabilitation efforts of brownfield sites in Canada, which are former industrial sites that are vacant or underused. The six Brownie Awards categories for which nominations are accepted are: REPROGRAM, REMEDIATE, REINVEST, REBUILD, RENEW and REACH OUT. There are three other awards that acknowledge the best small-scale project, best large-scale project, and best overall project for 2017; all projects are eligible for these three awards. In addition, we present the “Brownfielder” of the Year. The 2017 Brownie Award winners were announced during a gala dinner at the Delta Hotels Toronto on Wednesday, November 22nd, 2017. The City of Mississauga received a 2017 Brownie Award for Inspiration Port Credit for Communication, Marketing and Public Engagement. With Mississauga having one of the most significant brownfield sites on the north shore of Lake Ontario, it has been the focus of several community engagements. Located at 70 Mississauga Rd. S., the brownfield site is 72 acres (29 hectares) and 600 metres of Lake Ontario shoreline that neighbours the City’s historic urban waterfront village of Port Credit. The City-led community engagements explored future possibilities for the site with a Master Planning Framework that will help guide redevelopment. Working with a consultant team, the City involved residents and stakeholders in a variety of interactive sessions. The U.S. Interstate Technology and Regulatory Council (ITRC) recently released its newest guidance document, Characterization and Remediation of Fractured Rock. The guidance addresses significant advances in skills, tools, and lessons-learned in understanding contaminant flow and transport in fractured rock environments. If the unique characteristics of fractured rock sites are understood, then modern tools and approaches can be applied to successfully set and meet characterization and remediation goals at these sites. Contaminated fractured rock sites have often been considered too complex to be remediated, so site managers often default to simply containing the contamination. 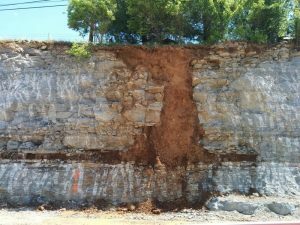 This guidance provides a high-level introduction to the unique puzzle faced when investigating and remediating fractured rock sites. 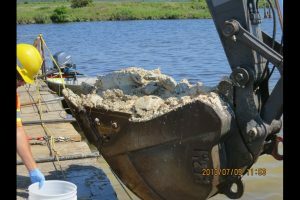 With the new strategies and technologies presented here, fractured bedrock challenges that may have prevented site remediation in the past are now surmountable. The guidance begins with a general discussion of fractured rock characteristics and a comparison of fractured rock and porous media CSMs. The guidance further introduces the parameters necessary for developing a fractured rock CSM and stresses the need for an experienced multidisciplinary team. The 21-Compartment Model is also introduced. This model is an adaptation of the 14-Compartment Model (Sale 2011) for unconsolidated materials. This model helps its users to visualize and understand contaminant storage, flux, and flow pathways in fractured rock. Understanding contaminant fate and transport in fractured rock allows site managers to develop a robust CSM that can guide remediation. Specific geology and lithology and structure control the unique mechanics of fluid flow in fractured rock. In addition to these physical properties, chemical properties affect fate and transport and are equally important in developing the CSM. A downloadable and searchable Tools Selection Worksheet is provided , which was initially used in ISC-1 (ITRC 2015b). The Tools Selection Worksheet allows users to screen for tools to address specific data needs and collect qualitative, semiquantitative or quantitative data as needed. The Tools Selection Worksheet links to detailed descriptions of all the tools and to references for further information. The guidance describes how data can be managed, interpreted, and displayed. Table 5-4 presents valuable lessons learned from real-world fractured rock characterization and remediation projects. As a CSM nears completion, the guidance offers direction for developing remedial objectives and strategies. A table shows how to assess the different remedial strategies that may address mass stored in the compartments described in the 21-Compartment Model. Strategies for monitoring contamination for compliance, system operation, and performance are also provided. The guidance explains how to design a monitoring well network that will provide the data needed to understand site conditions, remedy performance, and compliance. When applied properly, mathematical models are powerful tools for understanding contaminant flow. Chapter 8 describes various model types, proper application, data needs, calibration, sensitivity, and limitations. Finally, a discussion on stakeholder and regulatory considerations are presented, followed by a collection of case studies that demonstrate practical application of the concepts presented throughout the guidance. By Walter Wright, Mitchell, Williams, Selig, Gates & Woodyard, P.L.L.C. The U.S. House of Representatives (“House”) on November 30th passed amendments that would address the federal Brownfield program. H.R. 3017 is titled the “Brownfields Enhancement, Economic Redevelopment, and Reauthorization Act of 2017” (“H.R. 3017”). H.R. 3017 amends the Comprehensive Environmental Response, Compensation, and Liability Act and reauthorizes the United States Environmental Protection Agency’s (“EPA”)Brownfield Program. The legislation appears to have bipartisan support. The EPA has defined a “Brownfield” as “abandoned, idled, or under-used industrial or commercial facilities where expansion or redevelopment is complicated by real or perceived environmental contamination.” Besides EPA, many states have Brownfield programs whose purpose is to eliminate unnecessary barriers of the redevelopment of commercial or industrial properties which may have environmental concerns. Arkansas has had such a program for several years. A copy of H.R. 3017 can be downloaded here and copy of Senate Bill 822 here. This article was first published on the Mitchell, Williams, Selig, Gates & Woodyard, P.L.L.C. website. Walter G. Wright, Jr. is a member of the Business Practice Group. His practice has focused for almost thirty years on environmental, energy (petroleum marketing), and water law. Mr. Wright’s expertise includes counseling clients on issues involving environmental permits, compliance strategies, enforcement defense, property redevelopment issues, environmental impact statements, and procurement/management of water rights. Mr. Wright routinely advises developers, lenders, petroleum marketers, and others about effective strategies for structuring real estate and corporate transactions to address environmental financial risks. He also serves as General Counsel and provides legislative representation to the Arkansas Oil Marketers Association, Arkansas Recyclers Association (scrap facilities) and Arkansas Manufactured Housing Association. A unique part of his practice has been drafting and negotiation of a variety of specialized agreements involving the sale or consignment of motor fuels along with the ancillary agreements associated with the upstream segment of the petroleum industry. As reported in TB News Watch, the recommendations in a clean-up report of mercury in Thunder Bay, Ontario harbour have yet to be acted upon. It has been more than three years since a consultant’s report identified options for the management of 400,000 cubic metres (14 million cubic feet) of mercury-contaminated sediment. The source of the mercury in the sediment was industrial activity along Thunder Bay’s north harbour for over 90 years including pulp and paper mill operations. The sediment is contaminated with mercury in concentrations that range from 2 to 11 ppm at the surface of the sediment to 21 ppm at depth and ranging in thickness from 40 to 380 centimeters and covering an area of about 22 hectares (54 acres). The preferred solution in the consultant’s report was to dredge the sediment and transfer it to the Mission Bay Confined Disposal Facility (CDF) at the harbour’s south end. That came with an estimated cost of $40 million to $50 million, and was considered the best choice based on factors such as environmental effectiveness and cost. The consultants also looked at other options, including building a new containment structure on the shoreline adjacent to the former Superior Fine Papers mill. Jim Bailey, a spokesperson for the Thunder Bay Remedial Action Plan, a public advisory committee that is partially funded by Environment Canada and the Ontario Government and oversees monitoring of the harbour pollution, says no solution has been chosen as yet, and there is no money for doing the work. “One of the holdups is identifying a lead organization or agency to lead this cleanup. Without a lead, obviously the project can’t go forward, so that is one of the sticking points,” Bailey said in an interview with tbnewswatch.com. 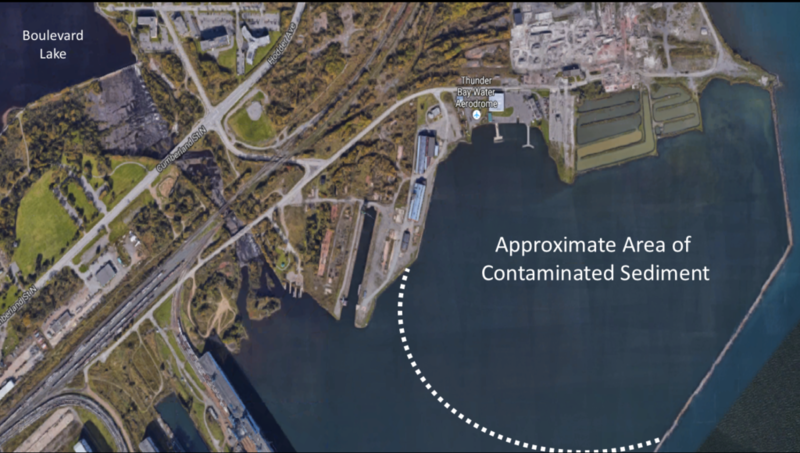 Thunder Bay RAP members have recently explored the feasibility of getting the contaminated area added to a federal list of contaminated sites, which might make its cleanup eligible for government funding. The sediment site is adjacent to the mouth of the Current River, and has been described as layers of “pulpy” material up to four metres thick in some spots. Bailey said being added to the federal list is one of the keys to getting closer to a cleanup, but the project would still require a cooperative effort involving a number of organizations. The preferred option for disposal at the Mission Bay CDF near Chippewa Park seems unlikely to come to fruition in any case. 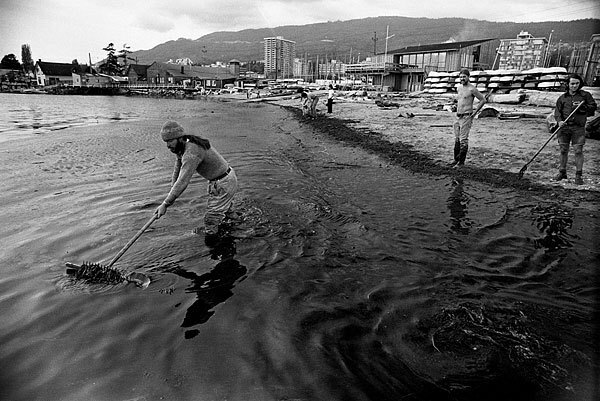 “That’s been used for decades to dispose of sediment collected for navigational dredging. It was never designed, to my knowledge, for contaminated material,” Bailey said. He added that the Fort William First Nation has also made it clear that it doesn’t want to see the contaminated material disposed of near their community. According to Bailey, the federal government is the legal custodian of the harbour bottom, but “at this point, Transport Canada has not been fully engaged in this process. Work needs to be done to hopefully get them engaged,” he said.